Image uploading: ISSF now allows users to include a photo when they create an SSF Profile which lets users see what the area looks like. Images can be added to SSF Profiles simply by copy and pasting the image URL into the space provided within the ‘background’ accordion. The SSF Profile Report: This new feature takes the data collected through our SSF Profiles and highlights some significant aspects of each. The selected data from each profile will be automatically generated into a PDF Report such as the one you see on the screen. Each report will be a total of two pages and will present ISSF users with a unique way to view the data collected in each profile. The first page of the report provides a quick overview of the fisheries characteristics and a map of the location with an ‘At-A-Glance’ section. This page also highlights how SSF are defined, how the catch is distributed through a variety of channels, and which species are being captured. The second page of the report highlights all of the established regulations as well as the major issues affecting the fishery. Additionally, this page shows how much household income SSF provide, the non-fishing livelihood activities fishers partake in, and the main form of governance. The report is finished off by including a photo of the location, some additional profile information, and our media information. 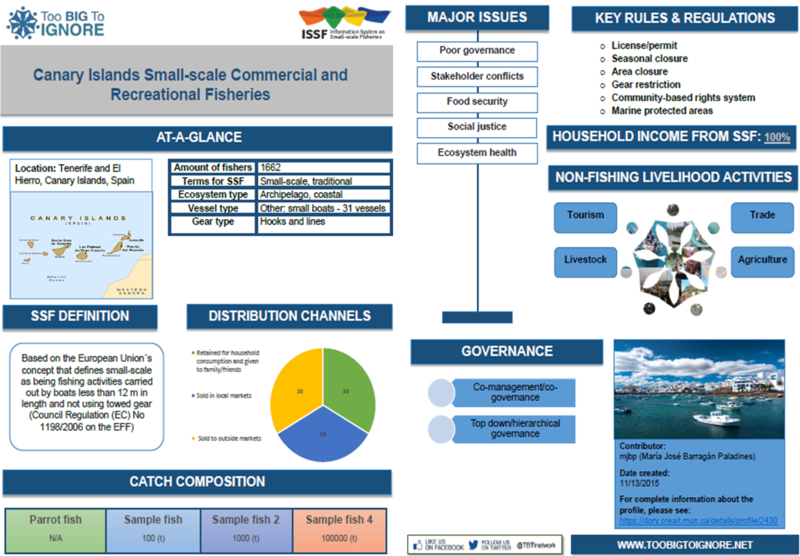 The SSF Profile Reports will be collected and produced into a citable e-book titled “Small-scale Fisheries of the World”. This e-book will provide readers with an opportunity to compare SSF characteristics from all around the world through maps, tables, and graphs.